Quorto (121) was clear second highest-rated and one of four Godolphin colts to appear in the top 16 in the latest juvenile classifications. Darley stallion Dubawi is responsible for outstanding colts Too Darn Hot and Quorto , who are officially the two highest-rated two-year-olds in Europe in 2018. The Classifications, compiled by a panel of handicappers and released in London today, feature the John Gosden-trained Too Darn Hot (rated 126) clear of his generation by 5lb. The colt, unbeaten in four starts as a juvenile, including Newmarket’s G1 Dewhurst Stakes, carries the colours of his breeder Lord Lloyd-Webber, with the breeding rights already purchased by Godolphin for when the impeccably-bred colt retires to stud at the end of his racing career. The Charlie Appleby-trained Quorto (121) was clear second highest-rated and one of four Godolphin colts to appear in the top 16 in the latest juvenile classifications. 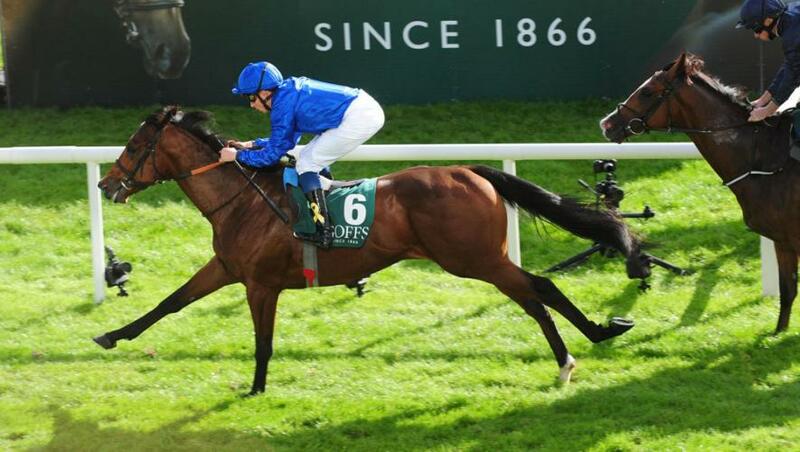 The Saeed bin Suroor-trained Royal Meeting (115), winner of Chantilly’s G1 Criterium International, was rated 1lb ahead of the Appleby-trained Line Of Duty (114), the gutsy winner of the G1 Breeders’ Cup Juvenile Turf at Churchill Downs. The other Godolphin interest concerns Persian King (114), the ownership being shared with Ballymore Thoroughbred Limited. Observations of the official handicappers were very interesting, particularly those of Irish official Mark Bird, who was responsible for the colt’s mark after his win in the G1 National Stakes at the Curragh. “He’s the first Dubawi to win a G1 at two (in Europe). He was rated 115 after winning the G2 Superlative Stakes at Newmarket, and then 121 after taking the National Stakes, his best performance,” Bird said. “There is an argument that Quorto could get a mile and a half, but I’d be inclined to believe he is a mile and a quarter horse, at this stage. “He settles quite well, so I’m quite confident of him getting a mile and a quarter, but a mile and a half might be a stretch. I’m very excited about him,” he added. Graeme Smith, the English handicapper, was most impressed by Persian King. “He’s the biggest and most handsome horse in the Classifications. He’s massive (in size). “He’s very good, with the size and scope to be a fair bit better than his official rating,” he added.